What you just read is a journal entry from the night I stopped self-harming. That was two months ago, and sometimes I still struggle. The harming ceased, but the thoughts, the urges, didn’t. The thing about self-harm is that it’s essentially an addiction. I’ll be the first to admit that at one point in time, I was addicted to the pencil sharpener I kept in my phone case. I don’t remember when or exactly why I put it there, but in times of darkness, it was an eerie comfort—a way out that I knew would relieve my emotional pain—if only for a moment. It’s as if my brain associated that temporary relief with the act of injuring. I relied on it like an asthmatic relies on their inhaler, except my way wasn’t ever going to save my life. But I didn’t see it that way at the time. Substituting my emotional pain for physical pain felt like the only option. They don’t make band-aids for the brain, and I didn’t really mind buying long-sleeve shirts. I didn’t mind the sting of the shower on my skin, I didn’t mind the scars. What I did mind was the vicious cycle I was stuck in. When I started to actually see what I’d been doing to myself, I felt so worthless, adding to the emotional turmoil I had come to believe could only be relieved by continuing to hurt. Self-harm is often rooted in shame and secrecy. I hated myself for what I was doing, but I felt I couldn’t tell anyone. The same may be true for you. But what’s also true is that you are not the only person to feel this way, and you are not the only person who does these things. Although I can’t tell you how to stop it, I can tell you that it’s possible, and worth it, and all the cliché things used to describe recovery. That’s the thing, the truth can often be cliché, but that doesn’t make it any less true. You can fight it and win. Don’t count the days, trust me on that one. Don’t suppress the urges but instead offer them a different outlet. Running or hiding from the way you feel leaves no chance to resolve it. It’s a tiresome life to always be living in fear of what you feel. Self-harm was my way of hiding. I never made a conscious decision to stop, I just made a conscious decision to tell someone, to throw out the blade in my phone case, to go for runs, to eat, to shower, to write. Little choices that saved my life. And maybe for my own self-reassurance, I want to tell you that these bad moments don’t equate to a bad life. There will be days where laughing and breathing become a lot easier. Someone will need to hear your story of overcoming. I know you’re tired and your feet may be weary from trudging through this chapter, looking for a light that never seems to grow closer or brighter no matter how far you walk. But that light is still there. I wish to tell you what that light tastes like, but I can’t just yet for I am still moving away from my addiction with every breath I breathe in favor of life. I want to tell you there’s not much further to go, but I am uncertain. 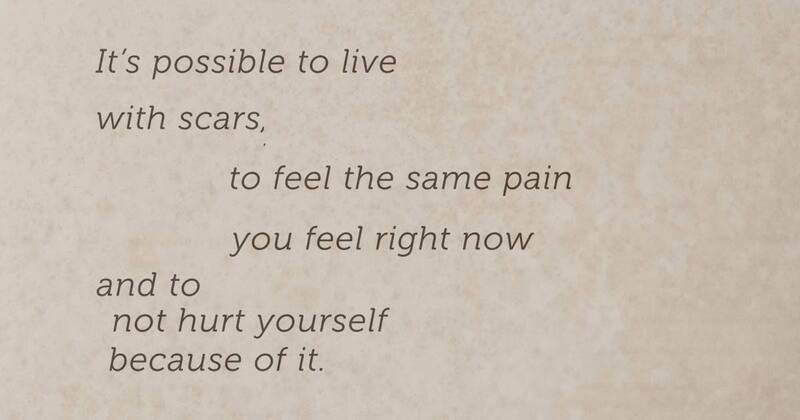 I can, however, tell you it’s possible to live with scars, to feel the same pain you feel right now and to not hurt yourself because of it, to want to stop. I can offer you my hand, for we are traveling similar roads and I am headed towards the light. Care to walk with me? Thank you so much for this. I have struggled with self-harm for about a year and a half, this was so encouraging to me! It helps me know that freedom from self-harm is real and that I can make it. Thank you again! This is beautifully written. It feels more believable than the too-happy “I made it out and you can too!” mantras I hear too often. Thank you. I desperately needed this today! Thank you! This was beautiful and helpful but for me personally, counting the days helps so much. I can see what I have accomplished (33days y’all!) and make a decision if whatever I am going through in that moment is worth giving up my hard earned days. This is a brilliant description of how recovery can feel! I am sure many people agree.. I am 8 years into recovery from self harm and I can tell you, those urges are still there. But they are nowhere near as frequent or as strong and overpowering as they were 8+ years ago. You will learn healthier coping mechanisms, you will get stronger and happier by the day. And the longer you go without doing it, the longer you will *want* to go. Eventually it is just not worth turning back, because you have come so far. That point is different for all of us, but trust me, it will come 🙂 congratulations on two months, that is HUGE! I needed this today, more than ever. This is so beautifully written and I can relate completely. Thank you for sharing! Wow, I feel like I could have written this. Thank you, and blessings in your journey towards recovery. This is great. I struggle with self-harm and I have wandered alone in this world for so long. I had turned to sleeping with people because it made me feel that in some way, that person cared about me when in reality I was throwing myself down a slippery slope that I couldn’t seem to find a way back up from. I want everyone and especially you to know that this has helped me, and this is the first time i said anything about this to anyone. Thanks for listening… Stay Strong. I’ve been clean since last October. It is difficult but it is possible, and worth it. I’m here walking right along with you. You’re absolutely right, self-harm doesn’t make you a bad person whatsoever. We’re proud of you for continuing to fight and for being vulnerable and honest with us. Thank you for being here, for being you. This came at an exact moment I was just fed up… that light won’t show but this right here has made me feel less alone. Thank you. I’m suffering from selfharm for 14 years now. I started when I was 10 years old. It’s hard not to do it and every day I don’t hurt myself is a victory. That does not mean those other days are a failure. They are just part of my way to stop it for good. This is beautiful. It’s beautiful because I can relate and have gone through the same exact feelings. I’m now 2 and a half years sober but it’s still a struggle. Recovery is the hardest thing to do for yourself but it’s worth it and you are worthy of a healthy life. Build a life for yourself that’s worth living. Im have also found this to be an addiction.. I started when i was 18 and i havent self harmed in 11 years but have found myself in a very deep dark hole that feels long lasting and recently started back up and cant seem to stop.. I completely relate to this entire post. 😭 sometimes just feels nothing will get better and that temporarily physical pain relieves the emotional pain..
We’re sorry that you are struggling with self-harm, but we want you to know that these tough days don’t define you. You are strong and you can start again with help and support. Would you email our team at info@twloha.com? We’d like to offer you support and encouragement. Thank you so much, this is exactly what I needed to hear tonight. I have always felt so alone in this, thank you for reminding me that I’m not. I would love to walk with you, if you’ll have me? This is saving me right now. I relapsed 3 nights ago after almost 2 years without self harm, and I feel lower than I ever have. I thought I was done with this, but clearly I need to put more practice into finding alternative outlets. Thank you for making me feel like I am not alone. Please know that a relapse does not erase all of your progress. It’s OK. You’re OK. The fact that you’re here and you’re continuing to try is everything. Would you email us at info@twloha.com so we can learn more about you and offer you some support?